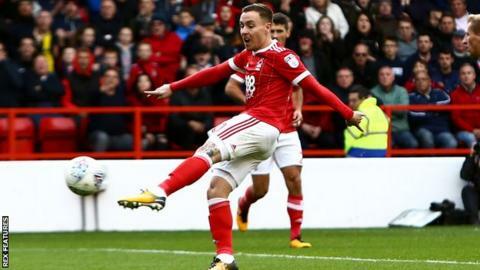 Nottingham Forest secured their third win in eight matches as Burton failed to score for a fifth straight game. Burton have the joint-worst defensive record in the Championship with 25 goals conceded, but they kicked off on the back of three successive clean sheets away from home, and their disciplined defence restricted Forest to just one shot on target in the first half. Albion also have the Championship's bluntest attack with just six goals this campaign, but created the better openings before the break, with Jake Buxton flicking an effort wide from Jamie Allen's free-kick. Mark Warburton's side came out with much more pace and threat after half-time and overwhelmed the visitors, Liam Bridcutt and Ben Osborn forcing flying saves from Bywater with long-range efforts. Dyer dragged a late shot wide as Nigel Clough's side equalled their longest goal drought in the league with another fruitless afternoon in front of goal. They have scored only once away from home in the league this season. Forest, who kept only their third clean sheet of the season, moved up to 12th and within three points of the play-off places, while Burton stay 22nd after their third league defeat in four matches. "The message at half-time was just to play our game, because the crowd were getting restless. "All we needed to do was change the tempo and we saw that in the second half, when we were much better. "It sounds very basic, but it is true; move the ball quickly, play one and two-touch football. Play the ball forward, split units and be positive in your decision-making and you will get your rewards." "For all the work you do in the middle of the pitch, results normally come down to what you do in both penalty areas and at the moment, we are not good enough in either of them. "We just seem to have a lack of confidence at the minute; we take that extra touch, we want that extra moment, instead of getting a shot away. "We had chances to win the game in the first half, with one great chance in particular. With the atmosphere around the ground at that point, had we got the goal, it might have been enough. "The breaks seemed to go Forest's way, but we have to do more ourselves. We cannot bemoan refereeing decisions." Match ends, Nottingham Forest 2, Burton Albion 0. Second Half ends, Nottingham Forest 2, Burton Albion 0. Attempt missed. Tom Flanagan (Burton Albion) header from the centre of the box is too high. Assisted by Jamie Allen with a cross following a corner. Corner, Burton Albion. Conceded by Joe Worrall. Attempt blocked. Marvin Sordell (Burton Albion) right footed shot from the right side of the box is blocked. Assisted by Luke Varney. Sean Scannell (Burton Albion) wins a free kick in the defensive half. Attempt missed. Lloyd Dyer (Burton Albion) left footed shot from the centre of the box is close, but misses to the right. Assisted by Sean Scannell. Corner, Burton Albion. Conceded by Michael Mancienne. Substitution, Burton Albion. Luke Varney replaces Ben Turner. Liam Bridcutt (Nottingham Forest) wins a free kick in the defensive half. Goal! Nottingham Forest 2, Burton Albion 0. Eric Lichaj (Nottingham Forest) left footed shot from the centre of the box to the bottom right corner. Assisted by Barrie McKay. Attempt blocked. Andreas Bouchalakis (Nottingham Forest) left footed shot from outside the box is blocked. Assisted by Daryl Murphy. Attempt saved. Lloyd Dyer (Burton Albion) header from the left side of the box is saved in the centre of the goal. Assisted by Ben Turner with a through ball. Kieran Dowell (Nottingham Forest) wins a free kick on the left wing. Substitution, Nottingham Forest. Andreas Bouchalakis replaces David Vaughan. Substitution, Nottingham Forest. Kieran Dowell replaces Jason Cummings. Attempt saved. Daryl Murphy (Nottingham Forest) header from a difficult angle on the right is saved in the centre of the goal. Assisted by Ben Osborn with a cross. Attempt missed. Barrie McKay (Nottingham Forest) right footed shot from outside the box misses to the left. Assisted by Liam Bridcutt. Jason Cummings (Nottingham Forest) wins a free kick on the left wing. Corner, Nottingham Forest. Conceded by Stephen Bywater. Attempt saved. Ben Osborn (Nottingham Forest) left footed shot from outside the box is saved in the top left corner. Assisted by Jason Cummings. Attempt blocked. Sean Scannell (Burton Albion) left footed shot from outside the box is blocked. Assisted by Ben Turner. Foul by Barrie McKay (Nottingham Forest). Stephen Warnock (Burton Albion) wins a free kick on the left wing.